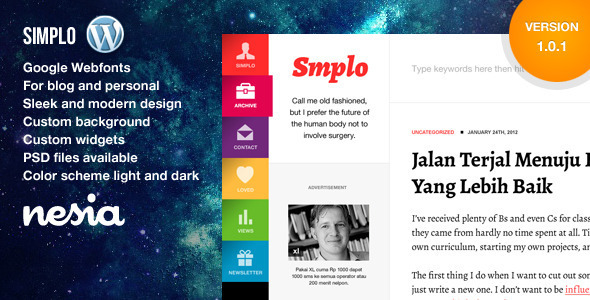 Simplo WordPress theme is built on top rock-solid HTML5 and CSS3 Framework. It’s clearly that this theme has a responsive layout with adaptive approachment for each devices such as iPhone, iPad and many popular devices out there, give it a try using your device(s). Moreover, it comes with tons of features below. Dummy data (widget, theme setting and posts) available for staging your site so you can import all data and have a staging site like the demo. Wanna help for setup? Just give us a call through contact form on profile page, it’s free. Custom header layout on the side or on top layout. Custom google webfonts all fonts are perfect for heading and body text. Responsive layout for tablet and mobile devices. Video support via oembed, list video support here. Working ajax contact form with Google Map location on template page for contact. Minimalist and usable design orientation with content oriented in mind. Supports are provided via forum support for better maintain each tickets. Don’t forget to register yourself, welcome! Yes, we build this template on top (very) rock-solid framework and that’s all already inside this Simplo WordPress theme bundle, just for you!